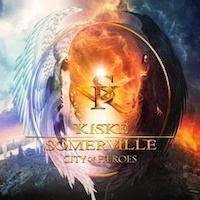 RockUnitedReviews: KISKE/SOMERVILLE: "City Of Heroes"
Michael Kiske (Helloween, Unisonic, etc.) and Amanda Somerville (Trillium, Avantasia, etc. ), our two lead vocalists in the City Of Heroes. It's one of those huge melodic metal projects by Frontiers and all the songs are co-written by the pair of Mat Sinner (Sinner, Primal Fear) and Magnus 'Klister' Karlsson (Primal Fear, Allen/Lande, etc). The follow-up to the 2010 album and Sinner/Karlsson are as always responsible for everything from production to backing vocals and all the instruments with the exception of drums, the work of Veronika Lukesova. You will quickly notice the main theme and ground structure of the album. The duet of female/male vocals during the verse and mostly Somerville during the refrain. The typical standard arrangement as of lately and it's a bit boring in the long run. I wish they could have recorded Kiske's voice as the number one lead track on the choruses. But no such luck. It's mostly layers and layers of Somerville and the lads are backing her up in the background. And once you'll notice this, you simply can't let it go. It's so darn annoying. Track after track. It's nearly all the same with very few exceptions. Overall, the guitar and keyboards combine nicely with pattering drum-work to produce a stunning rhythm of symphonic metal with just the hint of proper metal. Tracks such as "Walk On Water" and "Open Your Eyes", the Eurovision song contest version of Within Temptation? Cheesy and sort of tacky metal with choruses that are too syrup and sticky. However, the first of the two wins you over with its enchanting refrain 'over the mountains and the seas. I walk on water. I'm drying all your tears', and you'll be humming the tune all day (for better and worse). The latter is duller than Rob Schneider though and I always tend to skip the track. "Rising Up", a lot better, powerful, and it's the old Phoenix story of the past. "Salvation", gives Within Temptation a run for the money. "Lights Out", Ankie Bagger pop (where were you last night - do the google/youtube search if needed) meets melodic metal and it works just fine. "Breaking Neptune", one of few songs featuring strong male vocals during the refrain and also the only none Sinner/Karlsson composition. It's the Somerville/Gommans tune and the nice change from the rest. "Ocean Of Tears", the fine ballad and "After The Night Is Over" give our heroes another chance to rest for a moment. Final verdict: it's difficult to find anything too negative to say about City Of Heroes. It's nice, it's catchy. It's solid stuff with smothering metal songs. Do not confuse this with Power Metal though, since there's absolutely nothing sinister or dark about this album. Jim PETERIK & Marc SCHERER: "Risk Everything"
ARSENIC UNBIRTHDAY: "Ravens and Writing Desks"
GOV'T MULE: "Stoned Side Of The Mule Vol 1 & 2"
ULI JON ROTH: "Scorpions Revisited"
STONEGHOST: "New Age Of Old Ways"
BETH HART: "Better Than Home"